Capcom is pleased to officially announce that court will be in session in Phoenix Wright: Ace Attorney – Spirit of Justice on September 8, 2016. The latest courtroom proceedings will be available to purchase digitally for $29.99 / £24.99 / €29.99 from the Nintendo eShop for the Nintendo 3DS family of systems. All-new evidence in the form of a trailer is available noe introducing many of the game’s colorful characters and their respective features and special abilities. For those wanting a preview of the upcoming drama, a free demo will be available to download for all consumers in the Nintendo eShop on Nintendo 3DS on August 25. The demo features a section from the first courtroom scenario in the game, and allows players to slip into Phoenix’s shoes in the Kingdom of Khura’in and get a taste of the newest gameplay feature, the Divination Séance. Through royal priestess Rayfa and her Divination Séances, players can revisit the last moments of a victim’s life and must fight to unravel the discrepancies and contradictions between the Royal Priestess’s Insight and what is shown in the séance. This demo is sure to make for an exciting first test to bring about justice before the game’s full release! This new game’s cast is full of many zany favorites alongside a new ensemble of characters to meet, and today Capcom is announcing several of them, including the return of forensics scientist Ema Skye, who first appeared in the original Phoenix Wright: Ace Attorney. Ema has passed her certification exams and is now a full-fledged forensic investigator. Here she returns to assist Apollo in his defense of the series’ popular magician, Trucy Wright, Phoenix’s adopted daughter. 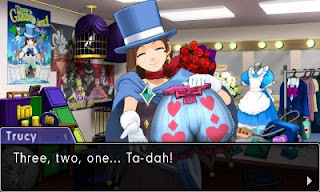 Trucy is famed for her magic tricks and vanishing acts, until she suddenly finds herself mixed up in an unfortunate incident that takes place during one of her magic shows. With Phoenix away, it’s up to Apollo and Athena to uncover the truth about the tragic death of Mr. Reus, one of Trucy’s co-performers. During this case, players will also meet the brand new character Bonny de Famme, a fledgling magician who appears in Trucy’s show and wants to help Apollo in any way she can, but what will her witness testimony reveal? 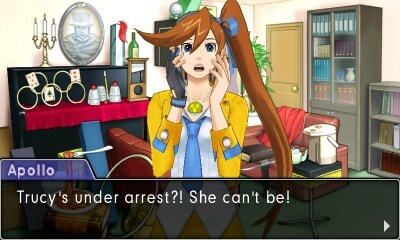 In Phoenix Wright: Ace Attorney – Spirit of Justice, forensic investigation techniques play a vital part in players analyzing the evidence to help solve some of the game’s mysteries. Utilizing the features of the Nintendo 3DS system, players will be able to dust some crime scenes and search for fingerprints, while being able to examine certain objects at the scene a full 360 degrees to uncover hidden evidence like never before in the Ace Attorney series. Will the fingerprints match any of the suspects on file and uncover new truths? 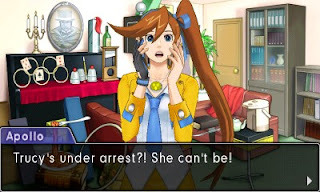 Combined with the ability to examine video evidence from multiple angles to check for inconsistencies, and other investigation techniques, this latest title in the Ace Attorney series is set to be the most thrilling outing to the courtroom yet!